Expected to ship on or about 08/05/19. Advent candle set for your Advent wreath and celebration includes five candles. 10 wax taper candles with 7/8" base. 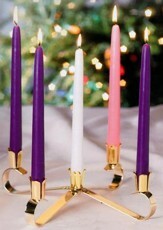 The set includes three purple candles, one pink candle, and one white candle to use as the Christ candle. 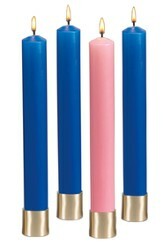 Q: Do these candles fit your nativity advent wreath? Yes, these candles will fit the "Nativity Advent Wreath" (CBD stock number 86269). I'm the author/artist and I want to review Advent Candles, 10 x 7/8 inches, 3 Purple, 1 Pink, 1 White.